Following are main developments after a massive earthquake and tsunami devastated northeast Japan and crippled a nuclear power station, raising the risk of an uncontrolled radiation leak. An aide to Prime Minister Naoto Kan says the government’s main aim is to stop radiation leaks from the stricken Fukushima Daiichi nuclear plant that are spooking Japanese, hindering work and frightening tourists. Plant operator Tokyo Electric Company (TEPCO) has poured concrete into a crack in a concrete pit in reactor no. 2 but this has failed to stop leaks. TEPCO is also using water-absorbent polymers, with plans to top the polymers with more concrete to halt the leaks. Engineers examine alternatives to pumping in water to cool the reactor, including an improvised air conditioning system, spraying fuel rods with vaporised water or using the plant’s cleaning system. Radiation levels in the sea nearby stand at 4,000 times the legal limit. A group of farmers from the Fukushima region came to Tokyo with Geiger counters to show their produce is safe. Prime Minister Naoto Kan ensured residents in the disaster zone on Saturday that the government would offer support in rebuilding. He entered the 20-km evacuation zone around the wrecked plant and visited “J-village”, a sports facility serving as headquarters for emergency teams tring to cool down reactors. Kan said on Friday that TEPCO should remain in private hands, even though the company would need financial assistance from the government to deal with the aftermath of the disaster. Earlier, the Manichi newspaper said the government would take control of TEPCO. Kan also said that he wanted to decide by the end of April on the content of an extra budget for earthquake relief. Chief Cabinet Secretary Yukio Edano said the evacuation of residents near the plant will be a “long-term” operation. A U.N. watchdog on Thursday suggested widening of the exclusion zone around the station after radiation measured at a village 40 km distant exceeded a criterion for evacuation. Japanese manufacturing activity slumped to a two-year low in March and posted the sharpest monthly fall on record as the quake and tsunami hit supply chains and output. A total of 11,938 people are confirmed dead by Japan’s National Police Agency, while 15,478 are missing. A total of 168,586 households are without electricity and 220,000 without running water. More than 164,200 people are living in shelters on high ground above vast plains of mud-covered debris. Thousands of Japanese and U.S. Soldiers conducted a search for bodies on Saturday using dozens of ships and helicopters to sweep across land still under water along the northeast coast. Estimated cost of damage to top $300 billion, making it the world’s costliest natural disaster. The 1995 Kobe quake cost $100 billion while Hurricane Katrina in 2005 caused $81 billion in damage. France Sarkozy is first foreign leader in Japan post-quake: he shelters his nuclear business and proposes May G20 meeting on nuclear safety standards. IAEA draws up safety standards, but they are not binding French President Nicolas Sarkozy on Thursday proposed a meeting of G20 nuclear industry officials in May to start hammering out new global safety standards in the wake of the power plant disaster in Japan. Japan’s battle to avert a catastrophic meltdown of fuel rods at the earthquake-wrecked facility north of Tokyo has triggered alarm and safety reviews in nuclear-powered countries around the world. Sarkozy, the first foreign leader to visit Japan since the March 11 disaster, said the incident should not cast doubt on the wisdom of pursuing nuclear energy itself but on the lack of international norms for ensuring the industry remains safe. “The problem is more about establishing safety norms than it is about the choice of nuclear energy, for this there is no alternative right now,” he told a news conference with Japanese Prime Minister Naoto Kan in Tokyo. He said France would ask the nuclear safety authorities of the Group of 20 countries to meet in Paris in May to lay groundwork for a special meeting of International Atomic Energy Agency (IAEA) conference the following month. “We need international safety standards before the end of the year,” said Sarkozy, whose country heads the G20 and G8 for most of 2011. The IAEA draws up nuclear safety standards and recommendations, but they are not legally binding. Nuclear safety is primarily the responsibility of member states. There is, however, a Convention on Nuclear Safety drawn up after the accidents at Three Mile Island in the United States and Chernobyl in Ukraine which obliges its signatories, currently 72, to achieve and maintain a high level of safety, largely based on the IAEA principles. Kan backed the French proposal for a global nuclear review, saying it was Japan’s “duty to accurately share with the world our experience”. Sarkozy, who flew to Tokyo after addressing a G20 seminar in China on global monetary reform, told Japan it had the support of the whole world as it strives to contain its nuclear calamity and deal with the aftermath of the earthquake and tsunami that left some 28,000 people dead or missing. A team of French nuclear experts, including the CEO of state-owned Areva , flew to Tokyo earlier this week to help Tokyo Electric Power (TEPCO) as it battles to bring its crippled Fukushima plant under control. France is the world’s most nuclear-dependent country, producing 75 percent of its electricity from 58 reactors. “Consider me your employee,” Areva Chief Executive Anne Lauvergeon told Japanese officials. At a meeting with French expatriates in Tokyo earlier, Sarkozy acknowledged that when France became the first country to tell its nationals to leave the city because of the nuclear disaster it “met with some ridicule”. France has since changed its advice. 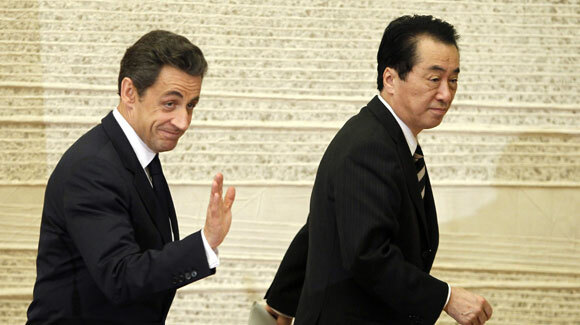 “All the experts agree that living in Tokyo now does no represent a health risk,” Sarkozy said.